Hello and welcome to the 50th installment of the SWD. SAA captured Atshanat Mari and Durobiyah (Idrisiyah) villages from IS northwest of Jirah Air Base. SAA and allies captured Maardas, Iskandariyah and Tell al-Duwayr from rebels today. 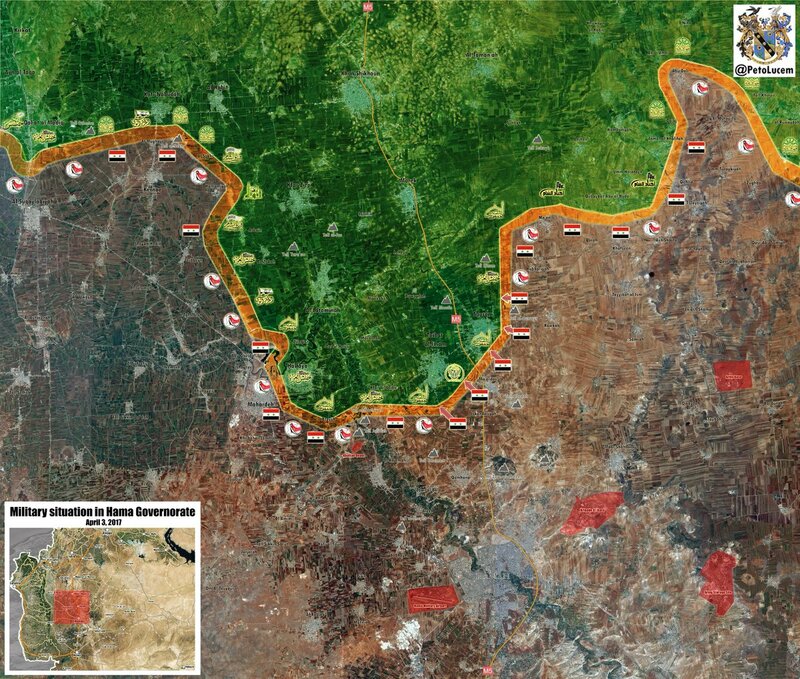 The only remaining important areas captured by rebels in the latest offensive are Souran and Tal Bizzam. Heavy airstrikes targeted Souran after which reports appeared suggesting that HTS retreated from it leaving their ATGM operators and troops that supported their offensive alone to face the SAA and allied forces. Groups that reportedly remain in Souran are Jaysh al-Izzah and Jaysh al-Nasr, both part of FSA. Major general Qasem Soleimani is still in Hama where he allegedly coordinated yesterday’s attacks on Halfaya axis. Based on this, it might be possible that IRGC, Liwa Fatemiyoun and maybe Hezbollah will advance on Halfaya – Al-Lataminah – Kafr Zita while SAA and NDF advance on Tayyibat al-Imam – Souran – Morek. SAA made small advances in al-Tahrib street in Qaboun-Barzeh pocket after breaking rebel’s defense line. Bigger news related to Qaboun-Barzeh pocket are coming from SOHR which claimed that in today’s attack SAA advanced in al-Mohafiz street and thus besieged Barzeh. If this is true Barzeh should be captured by SAA soon and rebels might even leave / have left from the area to Qaboun. 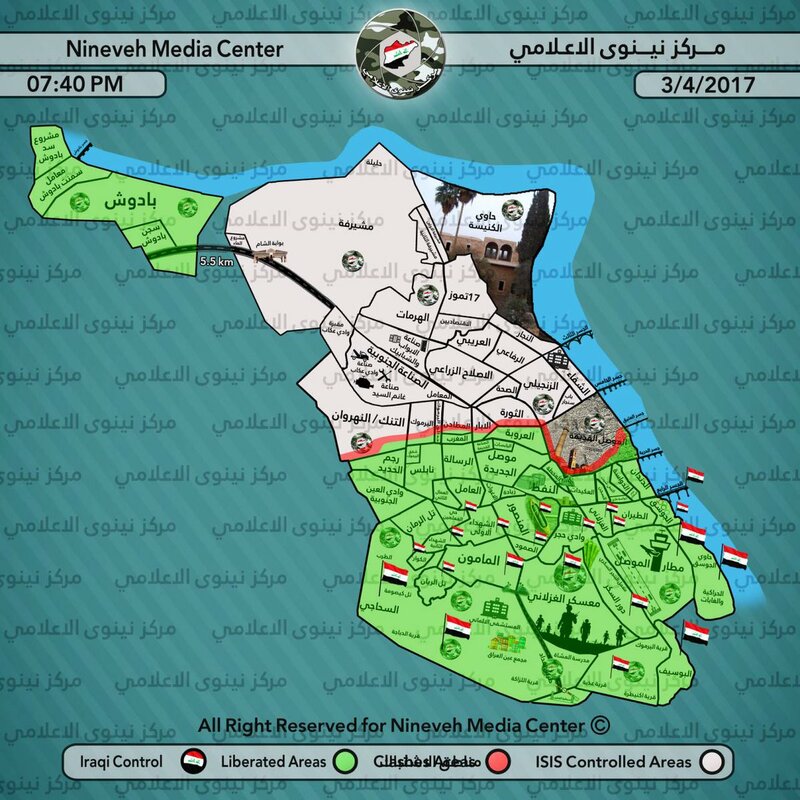 Iraqi Federal Police opened several corridors in old Mosul for civilians to evacuate the district, this move indicates that big assault on the IS-part of the district is coming soon and Iraq is attempt to minimize potential civilian casualties. Unfortunately this move might not be as effective as Iraq hopes since these evacuation attempts result in shelling of civilian corridors and shooting at those trying to leave by groups entrenched in cities as seen In Syria in East Aleppo. Civilians are very valuable for IS as they are used as human shields and only because safety of civilians IS is still present in west Mosul because Army’s operations are happening at a very slow speed to ensure that civilian casualties remain as low as possible. Even tough IS is losing on all fronts in west Mosul it still manages to find time to shell neighborhoods captured by Iraqi Army, reportedly more than 40 civilians were killed and wounded by shelling today. In Al-Kafaat, east Mosul IS assassinated two members of Nineveh National Security, what is more worrying is that this is the third incident of this type this week. After these assassinations took place a report came out stating that IS hacked Nineveh National Security’s database and removed a big number of people from wanted list, some even payed for the removal. Exclusive info transmitted by Mosul Eye. This event coincidences with Iraqi Federal Police decision to open corridors for civilians to leave from the most populated west Mosul district. It seems like IS fighters or supporters might try to leave old Mosul among civilians and then establish cells that would continue to terrorize Mosul for years to come. Iraqi Air Force was busy targeting IS today, in Nineveh governorate around Baaj IS camps were targeted and reportedly up to 50 militants were killed. Al-Qaim near Syria in Anbar governorate was also targeted by Air Force, ammo depots and HQs belonging to IS were primary targets. IS SVBIED hit a checkpoint west of Fallujah, casualties were reported but the exact number wasn’t stated. Southeast of Fallujah in Alexandria, Babil governorate IS suicide bomber attempted to target a funeral but was stopped by an Iraqi police officer that hugged bomber forcing him to detonate without inflicting civilian casualties. This heroic and selfless act of sacrifice by Iraqi officer saved many civilian lives, may he rest in peace. On the 2nd of April 2017 CJTF-OIR has conducted nine strikes in Syria. CJTF-OIR‘s main focus in Syria at the moment is Tabqa-Raqqa region where they did seven strikes supporting SDF‘s operation against IS destroying eight barges and five fighting positions; and suppressed two IS tactical units. Other area where two strikes occurred is Palmyra destroying three IS command-and-control nodes, three supply caches, a checkpoint and a bunker; and damaged three bunkers. Full report on CJTF-OIR strikes conducted in both Syria & Iraq can be found here.